Neeko and Maddie know when they are going somewhere when we gather their gear — leashes and a backpack (which holds boots, clean-up bags, water, and a collapsible water dish). Our gear consists of a cell phone, camcorder, fanny packs (filled with lots of goodies), and water. We are going Volksmarching. Volkssporting literally translates to sport of the people. Volkssports include bicycling, swimming, cross-country skiing, skating, snowshoeing, and walking. We participate in the walking sport called volksmarching or volkswalking (people’s walk). The volkssports program consists of organized events designed to appeal to people of all ages. It promotes leisure sports in the interest of family, health, recreation, fun, and companionship. Ask any greyhound if he would like to enjoy these benefits with the person he adores. The answer would be, Yes! Regular exercise is an integral and necessary part of any dog’s daily life, so we try to take daily walks with them to condition them for the volksmarches. These are deep, bonding walks for all four of us and essential for the dogs’ optimal health. Volksmarching is a very different kind of walk. It is non-competitive and geared to the whole family. It is not a pledge walk or a race. It is usually a 6.2 mile (10 kilometer) walk. There are also 3.1 mile (5 kilometer) walks for those who want to walk a shorter distance. It is a fun activity done with a club, your greyhound, and/or the rest of your family. We enjoy the volksmarches because the focus is on fun, fitness, and fellowship through walking, and we can do it with our two greyhounds. The Volkssporting philosophy recognizes that everyone who participates is a winner. This is exercise at our own pace, and it is a perfect activity for any sound, retired racer. Founded in Germany in 1968, it’s also known as Internationaler Volks Verband (IVV) which translates into International People Bonding. * See clarification at end of article.) The Federation is a non-profit organization. Full and preliminary member organizations of the IVV are in Germany, Austria, Switzerland, Luxembourg, South Tyrol, France, Belgium, Denmark, Norway, Italy, United States of America, Sweden, The Netherlands, Great Britain, Canada, Finland, Japan, Czech Republic, Hungary, Poland, Estonia, Slovakia, Greece, Iceland, South Korea, and Israel. Today there are thousands of clubs around the world. Its goals are to promote public health by offering non-competitive, outdoor sporting events and to further peace and understanding between nations by fostering international friendships through volkssports. The IVV unites, stimulates, and supports the national Volkssport associations’ efforts through a continuous exchange of ideas and experiences. Founded in 1979 the American Volkssport Association (AVA) is a member of the IVV. There are over 500 clubs and more than 3,000 non-competitive events a year throughout all 50 states. Our goal is to do a volksmarch in each of the 50 states. Walkers don’t have to join a club to enjoy the events; all events are open to the public. The President’s Council of Physical Fitness and Sports also recognizes the AVA. There are five AVA trail ratings. Each volksmarching club event has a well-planned, pre-marked trail on which we can enjoy the company of friends, family, fellow Volksmarchers, and our greyhounds. The trails are marked. They may be in cities, towns, parks, forests, rural areas, or anywhere there is a pleasant, interesting place to walk. Each club selects a trail based on safety, scenic interest, historic areas, natural beauty, and walkability. We mostly do rating 1 and 2 walks. We want to emphasize here that our greyhounds have never found these walks exhausting. They have never been injured or even stiff the next morning. It is a good healthy exercise that promotes a longer, healthy life for your greyhound. Rating 1 is an easy walk on pavement or a well-maintained trail with no significant hills. It is probably suitable for wheelchairs and strollers. Mildly handicapped persons would probably have little difficulty. Rating 2 is a moderately easy walk. It may be on pavement, on trails in woods or fields, or entirely in woods or fields. There are no significantly difficult hills, but it may not be suitable for wheelchairs and strollers. Rating 3 is a moderate walk in any setting with some difficult terrain and one or two substantial hills and/or steps. Rating 4 is a more difficult walk. It is most likely in a natural setting with poorly maintained paths and steeper or hilly inclines. Participants with certain health problems should take caution. Rating 5 is a very difficult walk. It is entirely in rough fields or woods with many steep hills, high-altitude trails, very rough uneven terrain, and steep or unstable inclines. It is not suitable for any person or greyhound who is not in above-average physical condition. Our beloved Misty, a cocker spaniel who passed away last year, went volksmarching for nine of the 14-and-a-half years she lived with us. Her veterinarian told us that these walks were excellent for her health and added years to her life because they strengthened her respiratory and circulatory systems and helped tone her muscles while maintaining flexible joints. The memories of all the walks we enjoyed with her will be with us forever. We expect these walks do the same for Neeko and Maddie — namely, help them live long, happy, healthy lives. All volksmarches begin at a designated start/finish area where the event is based and where everyone registers. Participants may choose one of two options: walk for no charge or register for that day’s event award and receive a medal or patch to show that they are a “winner.” In order for people to keep track of how they are achieving their fitness goals, they can join the Individual Achievement Award Program. The awards program is not required; it is solely for an individual’s personal gratification. Every walker, whether walking for credit or not, receives a start card with his own unique number. These cards are stamped at control points along the route to ensure each walker’s safety and are then turned in at the finish table. The numbered start card keeps track of how many volkssporters are out on the trail. Neeko and Maddie always seem quite eager to explore more new territories at their own speed, their tails wagging profusely. Along the route, there are strategically placed checkpoints or control points where we must pause to have our start card stamped. This is proof that we passed along the route, and it ensures our safety. Most people take two-and-a-half hours to leisurely stroll the 10-kilometer trail. Many clubs offer a shorter and longer distance trails as well. During organized events, water, and often sweets, are offered at the checkpoints. Most clubs have water dishes and treats for the dogs. In Germany the control points frequently offer a selection of beers, soft drinks, teas, hot wine, schnapps, and sandwiches. We have enjoyed exploring woodlands, coastal regions, college campuses, military bases, battlefields, cities, towns, and parks in many states. Intricate architecture, beautifully landscaped homes, luscious gardens, and breathtaking waterfalls are but a few of the sights we have encountered. We cross covered bridges, ride ferries, and maneuver inclines to continue on the trail. When we approach a stream, the dogs get excited because they love to lie down in the cool water. One especially fond memory is of a doe and her twin fawns crossing our path; we were in awe. Neeko and Maddie stood still and didn’t make a sound. We take time to enjoy festivals, fairs, and even parades we have encountered along our walking routes. Our favorite time of the day to Volksmarch is in the morning; the serenity is all-encompassing. Since we have all day to complete our walk, we always take a slow pace to really absorb the scenery and to enjoy the quality time together. We visit with a lot of horses. Once a llama stopped grazing in its pasture and came up to the fence to check out the dogs. The dogs hesitated a bit but then went up to the fence and sniffed the llama. When something catches our attention, we can take the time to enjoy the moment. We take time to talk with the other walkers out on the trail. Everyone is impressed that our greyhounds are so calm and like to walk because many people have the impression that greyhounds are only runners. People inquire about Neeko and Maddie. They want to know how old they are, if and where they raced, if we adopted them, and if they all greyhounds are this gentle. They are amazed at their softness. The number of people who don’t know what breed they are and who have never seen, let alone touched, a greyhound is eye-opening. Because of this, we promote greyhound adoption every chance we get. Maddie and Neeko are fabulous ambassadors. We meet all kinds of people — old and young, singles, couples, couples with children, and people with dogs and without. Some jog; some walk fast. Everyone does his own thing but we know many saw their first greyhound and learned about them on a Volksmarch. One walk in particular was key to promoting the greyhound as a walking companion and pet. In Allentown, Pennsylvania, Prevention Magazine’s walking wditor was manning a checkpoint. She inquired about our greyhounds and our volksmarching. This resulted in an article for the magazine’s walking newsletter about all four of us enjoying volksmarching. Volksmarching has definitely stirred an interest in greyhounds. After finishing the walk, we are never tired but are exhilarated and looking forward to our next volksmarch. When we arrive at the start/finish point we present our start card, our IVV record books, get our event and distance books stamped and do more socializing. Neeko and Maddie are like magnets; they attract attention wherever they are. They wait for anyone to pet them. Children just adore them because they remain calm. There are always more comments about how soft and gentle they are. There, we collect flyers on upcoming events. Each flyer states the distance of the event and the description of the trail. Some clubs offer two distances, such as a 5-kilometer trail and a 10-kilometer trail. Some clubs have 11 and 12-kilometer events. The directions to the events are stated in the flyers along with the start and finish times. The start times are normally between 8:00 a.m. and 1:00 p.m., and the events are finished by 5:00 p.m.
Each club’s flyer states the conditions of the walk such as whether or not leashed pets are welcomed. In our 14 years of volksmarching, we encountered just a couple of flyers that stated that pets were not permitted because the walks were in a nature center or the like. Water is always available at the start table and control points. Many clubs offer refreshments for sale. The granting of Achievement Awards was introduced to encourage participation of popular sporting events organized under the IVV rules and regulations. Since we wanted to be involved in the awards program and give ourselves an incentive to participate in these events, we purchased both the Event Record Book and the Distance Record Book. IVV issues awards for a milestone number of events (10, 30, 50, or more) and/or total travel distances (500, 1,000, 1,500 kilometers or more). After completing the milestones, we send our record books to the national office in Texas for a Certificate of Achievement, a patch, and a hatpin. Our accomplishment is printed in The American Wanderer, the national publication. These awards hold many memories for us. Many self-guided walking events occur that are called Year-Round events. The local club selects a trail, draws maps, writes detailed walking instructions, and sets up a permanent starting point. 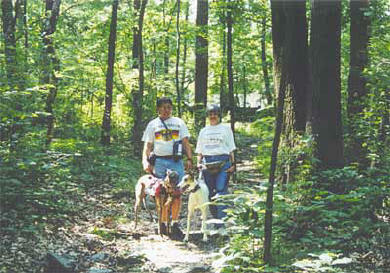 Our greyhounds and we arrive during the stated open hours, register, take a map, and enjoy the trail. Starting points are often hospitals, hotels, or convenience stores. At the start point, we ask the proprietor to point out the start box. Some proprietors are not club members; they volunteer to help the club. The box contains a registration log and detailed instructions. We sign the log and take a start card and trail map. At the end of the walk, we turn in our start card. If we walked for IVV credit, we stamp our books with the stamp in the box. If we registered for the event award, there are instructions on how to get it. Ever since our first volksmarch 14 years ago, it has become a lifestyle for us and now for our greyhounds. We plan our vacations and weekends around them. It is a great way for Maddie, Neeko, and us to enjoy new experiences, keep our minds active, and help our whole family have a totally balanced life. Because volksmarching is an aerobic form of exercise, we get adrenaline rushes from it. The walks release energy and combat boredom for our greyhounds while allowing us to spend quality, bonding time with our them. Most importantly, volksmarching is a wonderful, safe, and humane outlet to share with our hounds and raise a lot of greyhound public awareness at the same time. Volksmarching and greyhounds are a wonderful marriage for us; we promote two of our loves. If you are looking for something different to do with your “best friend,” give volksmarching a try. Remember: greyhounds love to walk. If you’re interested in organizing a volksmarch event in your area, please contact a local club listed on the AVA’s website. Hi, I just came across this line on your webpage about “Volksmarching”: Founded in Germany in 1968, it’s also known as Internationaler Volks Verband (IVV) which translates into International People Bonding”. CG SP 01 This article may be seen in its original form by purchasing the back issue from which it came. ALL RIGHTS RESERVED This article is not available for reprinting or reposting.